Ancestry DNA has announced the passing of another milestone: it now has 2million customers genotyped (DNA tested) and says it is the first and only consumer genetics company to achieve a customer base of such a size. Growth has been impressively speedy. After launching in the United States in May 2012, the company's dna testing product arrived in Ireland and the UK in January 2015 (see blogpost), and in Canada and Australia last June. This was followed by an announcement that the company had tested its one-millionth customer. In February this year, the global rollout continued with the test becoming available in 29 more countries. 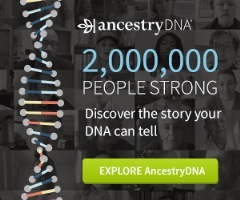 Ancestry has created a special presentation to broadcast news of its DNA success, and takes the opportunity to throw a few more big figures our way. The company's main (non-DNA) database now holds 17billion genealogy records and 70million family trees.